Interstate 45 crosses sparsely populated southeast Dallas. The region is substantially non-urbanized, especially south of the Trinity River. Interstate 45 ends at downtown Dallas. 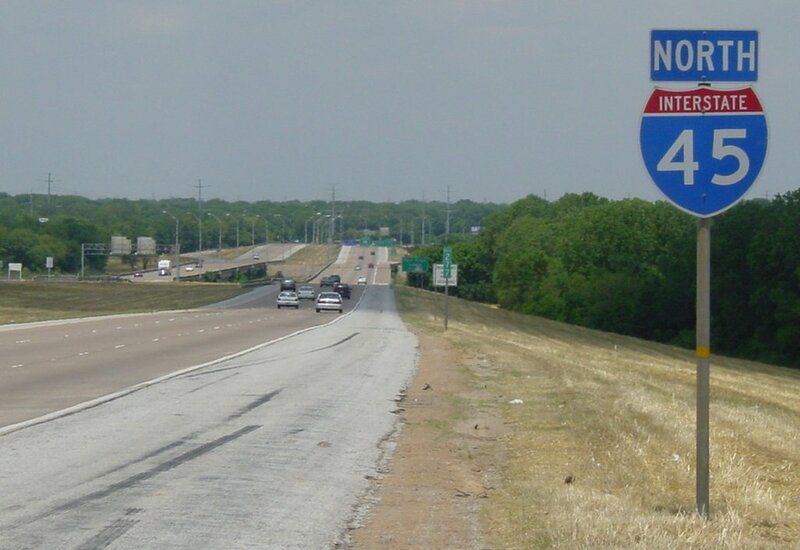 Complete in about 1975, the section of IH-45 between downtown and IH-20 was one of the last major interstates to be completed in the Dallas-Fort Worth area. Like most relatively new freeways, it exhibits excellent design characteristics: a wide right-of-way, grassy median, and plenty of room for expansion. In contrast, the section of IH-45 south of IH-20 was one of the first interstates to be contructed in Texas in the 1950's. It exhibited very poor design characteristics. While driving this facility in the late 1980's and early 1990's, I kept wondering to myself "when is TxDOT going to replace this antiquated facility?!!". Fortunately, the original freeway was upgraded in the 1990's and there are no longer any traces of the original facility. The last section to be upgraded is currently under construction and will be complete by 2002. This specific history of this freeway is still mostly a mystery to me. 1950's US 75 (now IH-45) is constructed as a freeway south of IH-20. This was one of the first rural interstates in Texas, and of course it was built to obsolete standards. The obsolete facility persisted until the 1990's. 1975? 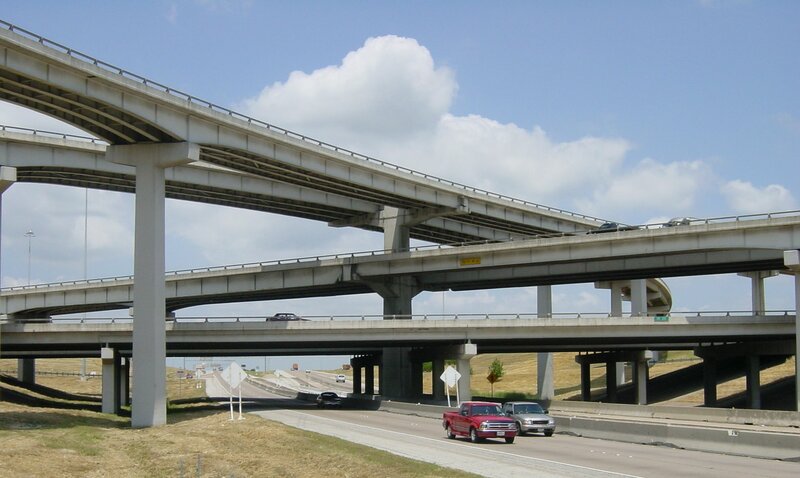 Interstate 45 is completed in Dallas. The last two sections were a 2 mile section north of Loop 12 and a short section north of the Trinity River. 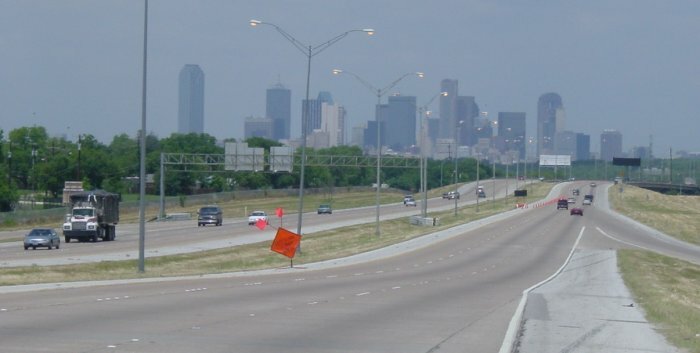 Mid 1990's Reconstruction of the freeway south of IH-20 to a six-lane facility with modern design characteristics gets underway. The last section is currently under construction just south of IH-20 anbd will be complete in 2002 (see photo below). (high resolution 108k) Reconstruction and widening of the freeway south of IH-20. 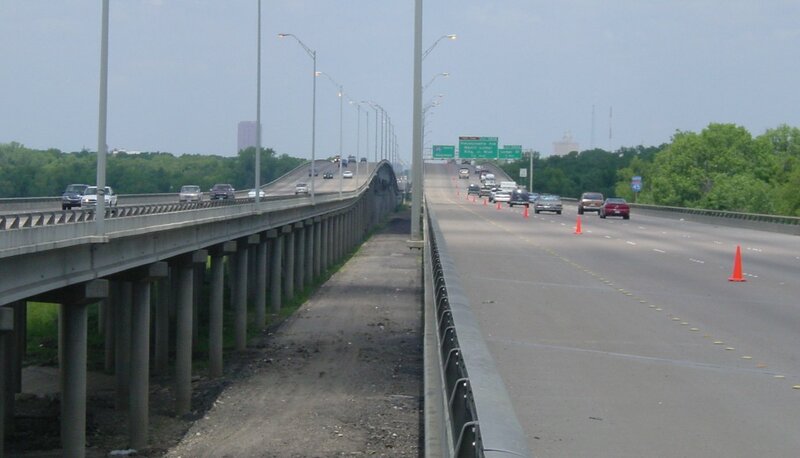 This is the last section of the freeway to be upgraded. View looks north. Photo taken 12-May-2001. (high resolution 214k) 4-level stack at IH-20. This stack is virtually identical in design to 3 other stacks along IH-20. View looks north. Photo taken 12-May-2001. (high resolution 103k) Just north of IH-20, looking north. Photo taken 12-May-2001. (high resolution 124k) Looking north from the Loop 12 overpass. Photo taken 12-May-2001. (high resolution 90k) Looking north from north of Loop 12. Photo taken 12-May-2001. (high resolution 125k) The Trinity River crossing is a long bridge over the Trinity flood plain. View looks north. Photo taken 12-May-2001. (high resolution 193k) The approach to downtown features some nice skyline views. View looks north. Photo taken 12-May-2001. (high resolution 151k) IH-45 through downtown Dallas is elevated on a long viaduct. Photo taken 12-May-2001.